Members of the Steinman Council are featured on a commemorative plaque that is displayed in the Steinman Room at NSPE Headquarters. Steinman Council members are also presented with a gold pin that bears the image of a suspension bridge representative of the many that were designed by D.B. Steinman. 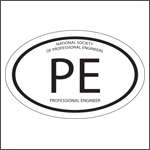 Contributions to the NSPE Education Foundation are cumulative. You may join the Steinman Council with a $1,000 contribution but if you make additional contributions you will be recognized at the subsequent levels as you achieve them. Currently, there are over 150 members of the Steinman Council.